Energy Design subcontracted for FSG to building this stellar rooftop solar installation for the Bend Best Western. 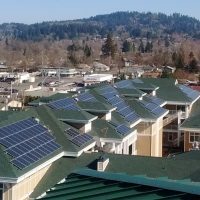 Energy Design provided design and installation services to create the active solar features of the Mahonia Building in Eugene. State of the art mixed use, right here in the heart of town. Emerald Peoples Utility District (EPUD) had us build this solar array for their Sharing Sun program working side by side with Advanced Energy Systems, another Eugene solar contracting firm. This is a 65.4 kW solar electric system for the Cascade Manor retirement community. Cascade Manor offers various levels of support, from independent living to assisted care, and has been serving Lane County seniors since 1967.